Walter Moritz Boas was born in Berlin on 10 February 1904. He graduated with the Diploma of Engineering (Applied Physics) at the Technische Hochschule, Berlin in February 1928 and a Doctor of Engineering (Dr Ing.) at the Technische Hochschule of Berlin early in 1930. I only hope that we shall succeed in providing not only the facilities, but also the freedom and happy atmosphere which are essentialâ€¦Dr Bastow and his colleagues are, I know, delighted to have you in the family circle. Boas found freedom, facilities and a happy atmosphere under the leadership of Bastow and he wasted no time in building up a research group on the physics of metals, adding to existing staff by recruiting new staff mainly from among his former students. Research projects were quickly under way on, for example, plastic deformation of alloys consisting of two phases, the destruction of order by plastic deformation and its recovery on annealing and the inhomogeneity of deformation of crystals in polycrystalline aggregates. Before a year had elapsed, the Section of Tribophysics was redesignated as a Division in CSIR (in 1948) with Bastow as Chief. 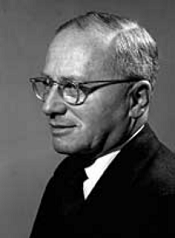 Boas was appointed its second Chief on 27 October 1949, a position he held until his retirement from CSIRO on his 65th birthday in February 1969. Boas, an enthusiastic man of science, was not really ready for retirement in 1969 and he became an Honorary Senior Associate in metal physics in his old Department of Metallurgy at the University of Melbourne. Once again he became an active member of the department and initiated there a research program on the mechanical properties of organic crystals. Thus in his final years of so-called retirement Walter Boas was back amongst the young students he loved and full of ideas and enthusiasm for revitalising an ageing department. During this period, he developed an active association with the Royal Melbourne Institute of Technology and was the first Chairman of the Applied Physics Course Advisory Committee. From 1969 he was Chairman of the Editorial Board of Search for ANZAAS. It is clear from Walter Boas’s life as a teacher and a scientific leader that he always had a great personal interest in the encouragement of high scientific achievement by young people, and for this quality, among many others, he will be remembered as an outstanding leader in Australian science. The high regard in which Walter Boas was held by the Australian scientific community is illustrated by the fact that, in 1984, the Australian Institute of Physics established the ‘Walter Boas Medal’ to promote excellence in research in physics in Australia. This Medal is awarded annually for original research work described in papers published in the preceding four years. In addition, in acknowledgement of Boas’s interests in the education of science students, the Department of Applied Physics of the Royal Melbourne Institute of Technology established the ‘Walter Boas Memorial Prize’ in 1983 which is awarded annually to the best student in the final year of the Bachelor of Applied Science degree course. A full account of the life and achievements of Walter Boas can be found by following the link in the Source details below. Clarebrough LM, Head AK, 1987, Biographical memoirs: Walter Boas 1904-1982, Historical Records of Australian Science, 6 (4): 507-517. [Australian Academy of Science – http://sciencearchive.org.au/fellows/memoirs/boas.html].